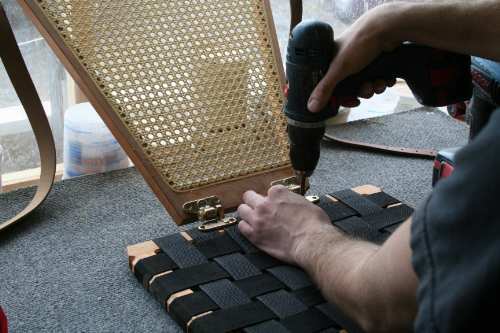 A Kevlar boat begins with a highly polished mold cast from one of our wooden Guideboats. This is probably the 5th or the 8th generation of this mold. 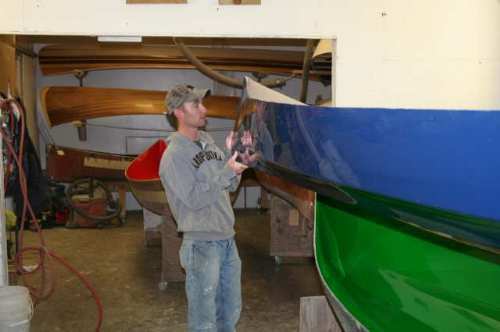 We can only build 300 or 400 boats from a mold before it begins to degrade and produce less than perfect boats. Behind Justin and Ian (the AGB owners) are rolls of fiberglass cloth (in white) and Kevlar, (in yellow.) Each roll of fiberglass costs $1,000. The Kevlar goes for $2,000 per roll. 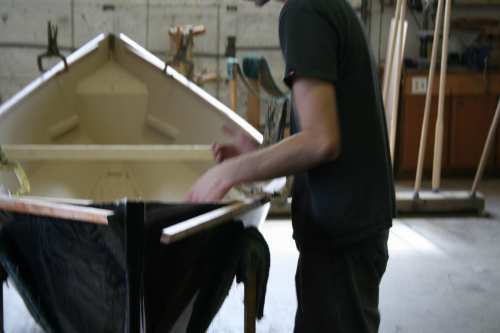 Once the cloth is dry-fitted to the mold, polyester resin is rolled into the cloth… this is actually the exterior of this black boat. 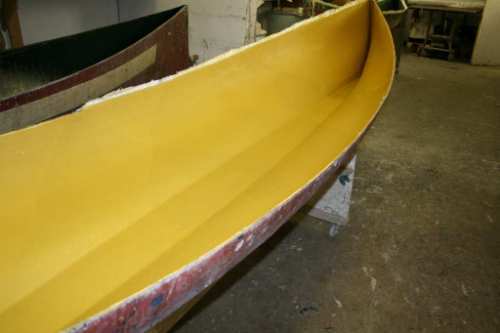 While this is a black boat, once the two layers of Kevlar have been added to the skin coat, the boat appears yellow. The interior will now be painted with a tan-colored gel coat. 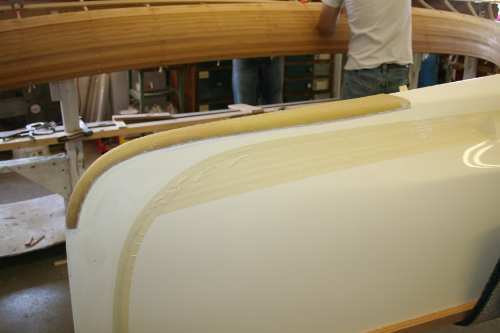 Dan is fiberglassing the seat cleats to the boat’s hull. In addition, he is installing a flotation air tank. The interior has now been completely painted; the seat cleats and air tanks are installed. The hull is now removed from the mold. Ian is using a high-pressure air hose and working the boat free; Ian and Dan are now lifting the boat with padded vice-grips. Once free, Ian and Dan lift the boat with padded vice-grips. 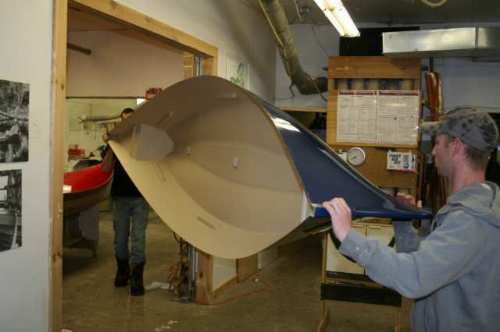 The next photos are raising the boat out of the mold and carrying it from the molding room. It is astonishing how light and flimsy the hull is at this point. When the gunwales are attached, the boat assumes its full rigidity. 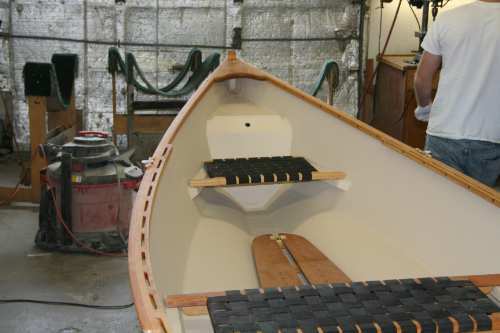 Dan fits the gunwales to the hull and brings the gunwales together, joining them to the breast-hook deck. 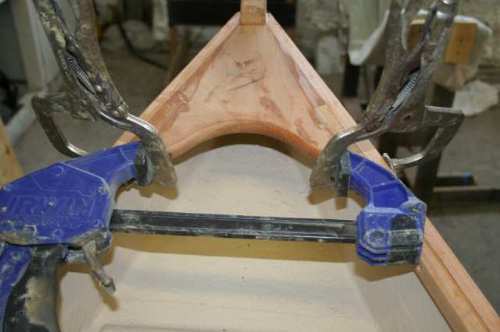 We use hundreds of clamps while building our boats. Here the deck and gunwales are being clamped, epoxy glued and screwed together. Tape is carefully applied to define the area to be black-coated. 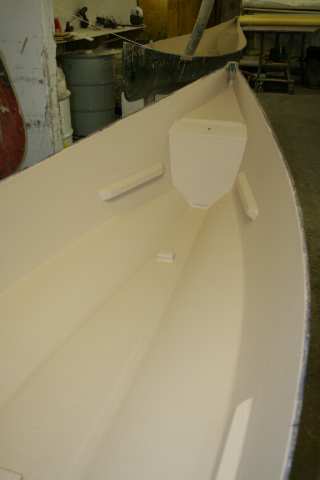 The Kevlar skid plates have already been bonded to the hull. 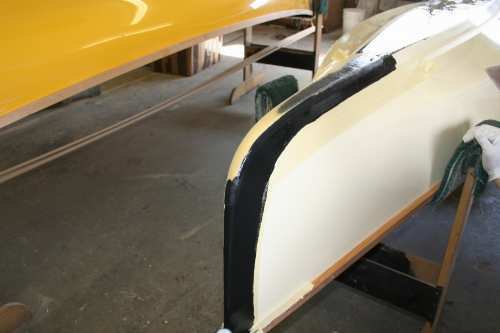 Black-coat is then applied to both the bottom of the hull and to the Kevlar skid plates. Because that is the only place they are made. & voilà, there’s your boat.